Bernkastel is well known for its outstanding wine growing area, "Doctor Weinberg". According to reports, the wine here helped to cure the Elector in 1356. Indeed, beginning in the Middle Ages, the wine business and river cruising along the Mosel (meaning the taxes) helped produce the city's notable wealth. Witness to this today is the city square with its half-timbered buildings, some reaching a height of five stories, as well as the city hall (1608) and the Michael fountain from the time of the renaissance (1606). Even older are the Michael's Church from the 14th century, the buildings of the Cusanus wine chambers and the so called "Spitzhäusschen" dated back to 1416, with its typical medieval wine cellar, upper floors covered in oak beams and a big roof storage for reserves. The structurally and architecturally harmonious market square has preserved most of its medieval atmosphere and gives the visitor a glimpse of the intellectual breeding ground of the 15th century, where groundbreaking philosophical, theological and scientific works were produced. These were essential for the transition from the Middle Age to Renaissance and modern times. On the other side of the Mosel and connected by a bridge, lies Kues, a wine village, incorporated into Bernkastel 100 years ago. In the year 1401, Nikolaus von Kues (Nicolaus Cusanus) was born here. He was a church dignitary, universal scholar and philosopher who rose to the position of Cardinal and whose theoretical writings signalled the end of medieval thinking. His works range from mathematical problems such as quadrature (squaring) of circles, to the universal concept of a world religion in which every religion would unite around a common basis. Very much worth a visit is the St. Niklaus hospital that Niklaus von Kues donated and to which he left his important library. To date, this remains unchanged. There, you find the most precious parts of the Cusanus library with its unique hand written collection of scientific works of the 9th - 15th Centuries and therefore one of the most valuable private libraries on earth. A special beauty and formal structure is seen in the medieval cloister of the monastery and the Gothic chapel where Cusanus is depicted as benefactor on the middle piece of the wing altar. The birth house of Cusanus lies at Kues, at the edge of the village heading towards Lieser. Here you will find an informative exhibition of the life of this significant philosopher and scientific theoretician. Here Cusanus finished his most important work "De Docta Ignorania". 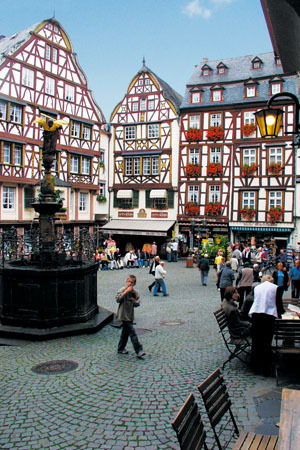 Overall, Bernkastel is a culturally rewarding experience. The area around Bernkastel was already populated in prehistoric time, as the Celtic hilltop site "Ober dem Lieser Pfad" bears witness. Later, the Roman Fort "Primcastellum" was located here, from which the name Bernkastel was derived. The Landshut castle above Bernkastel, first officially documented in the 7th century, was burned to the ground (without military influence) and remains in ruin to this day. It is best reached via a footpath through the vineyards, where you can gain an increasingly better view over Bernkastel-Kues and the Mosel loop with every step.